Action from Netherton v Coates at The Grange. 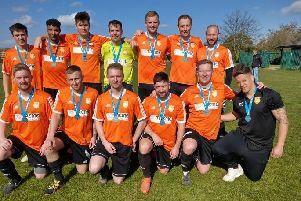 Andy Lodge has challenged his Coates Athletic players to take the Premier Division title race by the scruff of the neck on Saturday. Coates travel to second-placed Oakham United for a crunch top-of-the-table showdown which is likely to have a huge bearing on the destination of the championship. Lodge’s side are currently one point clear, but that margin is likely to become four points once the Cambridgeshire FA and Peterborough & District League chiefs have ruled on their controversial January abandonment against Leverington, although no decision is thought to be imminent. Lodge said: “It is a massive game on Saturday for both teams. I believe it has now become a two-horse race for the title between ourselves and Oakham - and whoever wins will become huge favourites. “If we win our fate will be in our own hands as we could effectively be seven points clear whereas if Oakham win they will move into the driving seat. Coates were thumped 5-2 by Oakham in the reverse fixture on the opening day of the season, but Lodge insists that result six months ago will have no bearing on the return clash. He added: “Some people have said to me that we owe Oakham one, but I don’t see it like that. “We had a bad day in the previous game, but the lads have responded brilliantly since. They won the next four games and have only lost twice more in the league all season. Coates and Oakham are scheduled to meet again the following weekend in a PFA Senior Cup quarter-final with Athletic having home advantage on that occasion. Coates were denied victory at Netherton last Saturday by a last-gasp leveller in a 4-4 draw as a nine-game league winning streak (including the Leverington clash) came to an end. They twice led through Dan Drane and Matt Heron and twice levelled courtesy of player/assistant boss Simon Flanz in a thriller. Coates have been in better form than an Oakham side managed by city-based Wayne Oldaker of late. Oakham have won only half of their last six league games, drawing two and losing one.